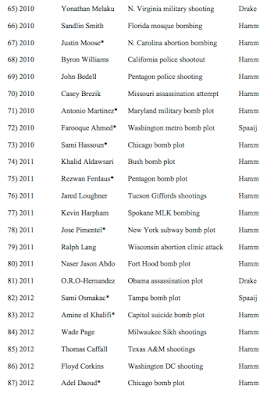 An interesting study by Mark Hamm and Ramon Spaaj looks at lone wolf terrorism in America. This research, the largest of its kind that has been created on lone wolf terrorism, compares the radicalization of lone wolves to terrorists who are recruited in a group setting. The study observes the changes in the methods used by lone wolf terrorists over time, how their targets are changing and how they are different than members of mainstream terrorist groups. The study provides us with a radicalization model, showing the process through which lone wolf terrorists pass as they proceed to become full-fledged terrorists who are willing to act on their grievances. 2.) Are not part of an organized terrorist group or network. 3.) Are without the direct influence of a leader or hierarchy. 4.) Adopt methods and tactics that are conceived by the individual without any direction outside command or direction. 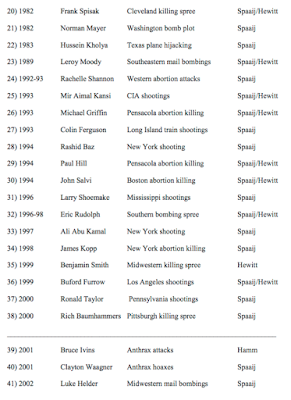 Of the 98 cases, 38 authentic lone wolf cases took place prior to September 11, 2001. After September 11, 2001, there were 60 cases of which 15 were sting operations conducted by law enforcement leaving 45 authentic lone wolf cases after 9/11. 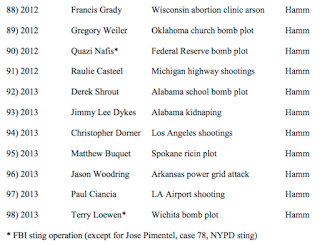 In total, this leaves 83 cases of authentic, verified domestic lone wolf terrorist cases since 1940. From 1940 to 2000, the 38 lone wolf terrorists committed 171 attacks which claimed 98 lives and injured 305 through the use of firearms and homemade bombs. About 60 percent of the lone wolves committed a single attack and 40 percent committed multiple attacks including Unabomber, Theodore Kaczynski who committed 16 bombings in a 17 year period. From 2001 to 2013, the 45 lone wolf terrorists committed 45 attacks which killed 55 and injured 126. These attacks included the use of firearms, bombs, aircraft, biological weapons, knives and construction equipment, a vast expansion of the methods used when compared to the period between 1940 and 2000. As you can see from this data, in terms of lethality, lone wolf terrorism is not on the rise in the United States, in fact, the 1990s saw lone wolf terrorists kill 30 people and injure an additional 182. That said, there has been a significant rise in verified lone wolf terrorists in America with 45 in 12 years (2001 to 2013) compared to 38 in 61 years (1940 to 2001). 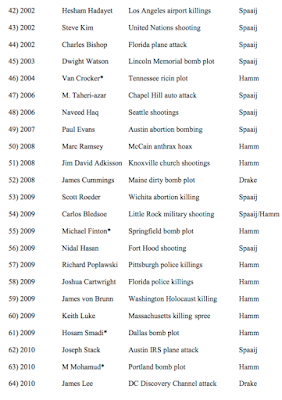 It is interesting to observe that there has been a significant change in the targets chosen by lone wolves over time. 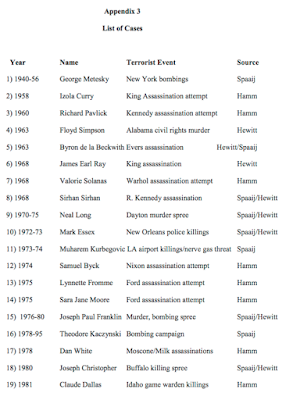 In the 60 years before 9/11, lone wolves killed or injured 12 law enforcement officers; this rose to 24 in the 13 years after 9/11 with all of these attacks taking place between 2009 and 2013. Prior to 2001, lone wolf attacks against police were motivated by black power, the abortion issue and the Palestinian issue. Since 9/11, with one exception, attacks by lone wolves against law enforcement has been motivated by either anti-government sentiment or white supremacy anger over the election of an African-American president. In addition, prior to 2001, lone wolf terrorists did not target any members of the U.S. military; since 9/11, lone wolves have killed or wounded 47 members of the military and in several cases, lone wolves have attacked or threatened to attack United States military bases. The methods used by lone wolf terrorists have also changed since 9/11. Prior to 2001, 234 victims were killed by lone wolf bombs; since 9/11, there have been only six victims of lone wolf bombings. Interestingly, since U.S. gun laws have been relaxed since the 1990s, the lone wolf's weapon of choice has become a wide selection of high-velocity firearms. Let's look at who is likely to become a lone wolf terrorist. There is no standard profile of a lone wolf terrorist, however, evidence shows that most of them are unemployed, single white males with a criminal record. They tend to be older, less educated and more prone to mental illness than their counterparts who join terrorist groups. Lone wolf terrorists tend to feel excluded by society and feel that they are deprived of what they feel that they are entitled to. Often, they hold the government responsible for the injustices that they face. 1.) Motive: Lone wolves tend to combine personal grievances with political grievances; in 80 percent of lone wolf attacks since 1940, evidence of both grievances were present in 80 percent of lone wolf cases. Violence is seen as the lonely way to what is perceived as an unjust system. 2.) 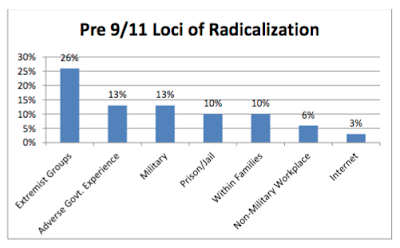 Affinity with Extremist Groups: Prior to 9/11, 63 percent of lone wolf terrorists had an affinity with organized extremists; surprisingly, this dropped to 42 percent after 9/11. This suggests that those that are seeking direction to becoming lone wolf terrorists are finding their motivation either online or through other media sources. 3.) Enablers: Lone wolves are enabled directly by people who assist in planning attacks or indirectly by people who provide inspiration for attacks. 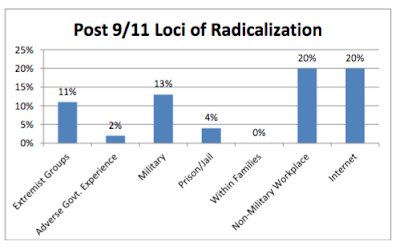 Prior to 9/11, 57 percent of lone wolves were enabled by others, a level that rose to 67 percent after 9/11. In the post-9/11 era, lone wolves were inspired indirectly by Osama bin Laden and Anwar al-Awlaki. In the case of post-9/11 white supremacist and anti-government extremists, indirect enablers included William Pierce and Alex Jones. 4.) Broadcasting Intent: While lone wolves may withdraw from society (i.e. the Unabomber), they may broadcast their intentions through letters, spoken statements, video uploads to the internet, through social media including Facebook and Twitter etcetera. Broadcasting is pervasive among lone wolves, taking place in 84 percent of the pre-9/11 cases and 76 percent of the post-9/11 cases. 5.) Triggering Event: The triggering event is the catalyst which causes the lone wolf to take action. In some cases, there is a single, "sharp" event that takes place and in other cases, it is an accumulation of events that causes the lone wolf to "snap" and take action. A triggering event was present in 84 percent of pre-9/11 cases and 71 percent of post-9/11 cases. Obviously, the ability of law enforcement to detect and prevent lone wolf terror attacks requires an thorough understanding of the radicalization process that lone wolves undergo prior to taking action that results in the deaths of innocent people. Recent attacks in the United States, particularly in San Bernardino and Orlando show that law enforcement has great deal of work to do if it hopes to curtail lone wolf terrorist attacks, attacks that high tech government snooping seems completely incapable of detecting. BARRY MANILOW – CAT’S OUT OF THE BAG- YOU CAN RELAX NOW!